Please note that I borrowed the pictures from the internet and didn’t cook all the yummy items shown. Blend oil and sugar and add other ingredients. Add raisins and nuts last. Back in 11x9x2 pan for one hour or more at 350 degrees. Put in heavy skillet, blend well. Cook 2 or 3 minutes. Remove from heat and cool. Add enough powdered sugar to spread well. Blend cake mix, cream cheese and milk with mixer, 2 minutes at medium speed. Add eggs, blend and beat for 2 additional minutes. 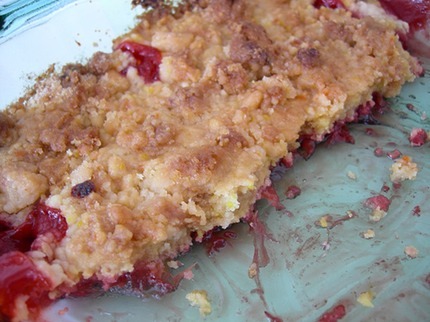 Thoroughly combine cranberries, walnuts, sugar and mace, fold into cake batter. 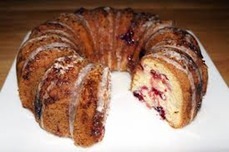 Pour into well greased 10” tube or bundt pan. Bake at 350 degrees for 1 hour. Cool 5 minutes. Remove from pan, cool, dust with confectioner’s sugar. ½ cup sifted powdered sugar. Cream butter. Add powdered sugar. Beat until light. Add eggs and vanilla. Beat until fluffy. Sift four with baking powder and salt. Add to egg mixture alternately with milk, beating well after each addition. Spread into lightly greased and floured 8 inch springform pan. Bake at 350 degrees for about 20 minutes. Cool in pan. 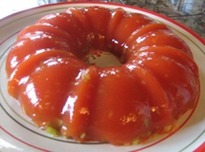 In sauce pan combine gelatin, granulated sugar and drink powder. Stir in ½ cup cold water. Stir over low heat until gelatin dissolves. Stir in 1 ¼ cup cold water. Chill until partially set. Peel, pit and slice peaches. Arrange on top of cooled cake. Pour gelatin over and chill until firm. 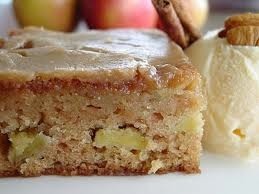 Remove cake from pan, garnish with topping. Mix above ingredients together and let stand one hour. 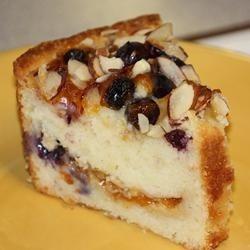 Mix egg-raisin mixture alternately with oatmeal and nuts into flour mixture. Dough will be stiff. Roll into balls and place on greased cookie sheet. Flatten with a glass dipped in sugar. Bake at 350 degrees 10-12 minutes. Heat marshmallows and juice concentrate in double boiler over simmering water. Stir occasionally until marshmallows melt. Cool. Fold in whipped cream. Pile into Vanilla Wafer Crust. Top with reserved crumbs. Chill until firm. Cut and serve with additional whipped cream. Mix together 3/4 cup fine vanilla wafer crumbs, ¼ cup melted butter or margarine Line bottom of 1 quart refrigerator tray with half of mixture. Reserve remainder for top. Mix sugar, syrup and butter in sauce pan. Bring to a boil over low heat. Remove from heat, stir in cream and vanilla. Combine all ingredients except chocolate chips. Beat 4 minutes. Fold in chocolate chips. Bake in greased and floured 12 cups bundt pan at 350 degrees for 50-60 minutes or until cake tests done. Cool in pan 10-15 minutes. Turn out on wire rack to cool. Sprinkle with confectioner’s sugar. Dissolve Jello in 2 cups hot water. 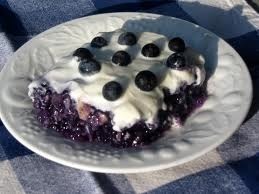 Using juice from pineapple and blueberries, add enough cold water to make 2 cups and mix with Jellos. Add fruit and refrigerate until set. 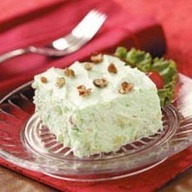 Top with sweetened whipped cream and garnish with nuts. Spread one #2 can crushed pineapple on bottom of pan. Spread one can (large size) Wilderness cherry pie filling over pineapple. Spread over top 1 box yellow cake mix (dry). Bake at 350 degrees - 50 minutes. None of us ever thought of Jello in quite the same way again after hearing Medra way “congealed salad” in her deep southern accent. Make each Jello according to directions. Put cream cheese in mixer bowl. Pour a small amount of Jello in and mix real well. Pour all of Jello in and blend. Refrigerate until it begins to set, then add nuts and pineapple. Note: drain pineapple and use juice in making Jello. Mix above well and shape teaspoons of mixture into balls. Make dent in center of each and place on cookie sheet. 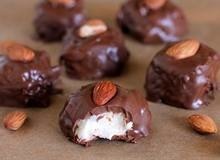 Melt two squares of unsweetened chocolate and fill hole with this mixture. Sprinkle sugar over finely chopped apples. Let stand for 30 minutes. Stir in rest of ingredients until blended. Bake in greased 8x8 pan one hour at 350 degrees or until done. Trinity’s Centennial was celebrated in 1983 culminating in a week-end of festivities November 6 and 7. Seven former pastors of Trinity were in attendance. Historical presentations were made to various areas of the church by Dorothea Schoenhuth, Ferris Clark and Charles and Helen Reed who shared their recollections with the Sunday School, congregation and various small groups. The quilt which hangs in the parlor was part of this project. Mix 2 cups fine vanilla wafer crumbs with ⅓ cup melted butter. Reserve 2 tablespoons for top. Press remainder in bottom of one quart refrigerator tray or pan of equal size. Cream ½ cup butter with 1 ½ cups sifted confectioner’s sugar. Add 2 eggs, one at a time beating well after each. Spread mixture over crumbs. 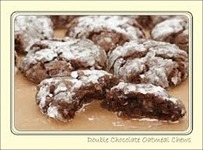 Combine ½ cup sugar, 2 tablespoons cocoa and 1 cup heavy cream whipped. 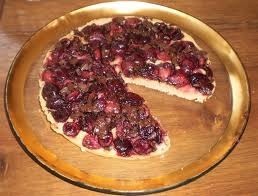 Fold in 1 cup chopped walnuts, 1 fully ripe banana, mashed and ¼ cup maraschino cherries. Pile on top of mixture in trays. Sprinkle reserved crumbs over. Chill 24 hours or freeze. Cut into wedges. * During the 1980s UMW provided cookies monthly to Good Sam. Cream butter and sugar until very fluffy. Fold in sour cream and almond extract. Sift together the flour, baking powder and salt, fold in. Place about ⅓ mixture in a greased and floured Bundt pan. 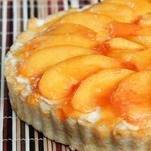 Sprinkle with ½ the almonds and ½ the apricot preserves over batter. Spoon on rest of batter. Add remaining preserves and top with remaining almonds. Bake at 350 degrees for an hour or until done. Cool on rack. Nancy was the wife of Pastor Boone White. 1 cup crushed Ritz crackers or buttered bread crumbs. Wash enough tomatoes to fit into baking dish with sides just touching. Remove from dish. Spread soup over bottom of greased dish. Cut thin slices from stem end of unpeeled tomatoes. Scoop out centers and save for stuffing. Cook two chopped onions, one cup green pepper, ½ cup chopped celery in 4 tablespoons of oil until done. Add tomato centers and cook more. Combine with 3 cups cooked rice. 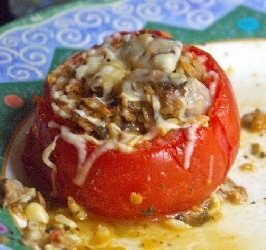 Fill tomatoes and top with the following crumbs. For a main dish add browned lean ground beef to stuffing. 2 cups fresh cranberries, sliced. Step 3: Melt 4 tablespoons butter and set aside. To 2 beaten eggs, add 1 cup orange juice and grated rind of 2 oranges. Blend in 4 tablespoons hot water. Pour mixture over combined dry ingredients (step 1 mixture). Stir with wooden spoon to moisten. Gradually add nuts and fruit (step 2 mixture). Add melted butter from step 3 last. Line two large loaf pan sides and bottom with waxed paper.Bake at 350 degrees for 40 minutes, reduce to 300 degrees and bake for 30-35 minutes more. Remove from pan at once. Wrap when cool and refrigerate. Ellen Kaiser, the Trinity Church Secretary, organized a Wassail Party between the two Christmas Ever services for many years. 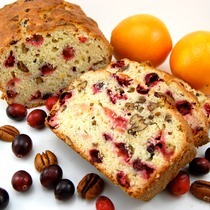 In each roaster, make up one can of orange juice and one can of cranberry juice. Add 2 ½ gallons of apple cider. Slice 2 oranges thinly and add to roaster. Wrap 1 tablespoon of allspice, 1 tablespoon of cloves and 4 cinnamon sticks in cheese cloth, tie closed and add to roaster. Gently stir salt into thinly sliced cucumbers. Cover with ice cubes. Add more ice if it melts. Drain; add onions. Combine remaining ingredients. Bring to a quick boil for 10 minutes. Add cucumber and onion slices and bring to boiling point. Pour into hot jars. Process in boiling water bath for 30 minutes. Makes 8 pints. * By the 1980’s Rebecca and Ruth Circles had combined to form one circle using both names. Ethel Linger Circle absorbed what had been the Martha Circle. Susannah Circle became and evening circle for working women or others for whom an evening was more convenient. 1 can mandarin oranges, drained well. Shake dressing ingredients in tightly covered jar, refrigerate. Cook almonds with sugar over low heat, stirring constantly until sugar is melted and almonds are coated. Cool and break apart. Tear lettuce and romaine into bite sized pieces (about 4 cups). Combine all in plastic bags and shake till evenly coated. Mix sugars, syrup, water, salt vinegar in 3 quart casserole dish or pitcher. Boil in microwave for 15-20 minutes until 260 degrees or a hard ball stage is reached. Pour over popcorn. Shape into balls (with greased hands). Lay out on waxed paper until cool, then wrap individually. When mixture begins to thicken and is slightly cooled, fold in: 4 beaten egg whites whipped with ½ cup sugar. Fill baked pie shells and chill. Serve with whipped cream or seven minute frosting. 1989: Mention is made of the Trinity Lady Callers providing visitation to church members. Heat oven to 400 F. Beat eggs until well blended. Stir in Oil and vanilla. Blend in sugar until mixture thickens. Mix flour with baking powder and salt. Blend in oil mixture. Drop by teaspoons onto greased cookie sheet. Gently press each cookie with bottom of glass dipped in sugar. Top with nutmeg before baking or frost when cool. Bake 8-10 minutes. Many of our memories of Jim Siedelmann, long time Scoutmaster of Troop 6, involve Dutch Oven meals prepared for church functions. 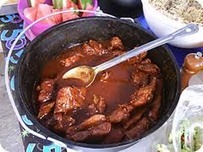 His wife, Cheryl, provided the following information and recipes. The name “Dutch Oven” is applied to various cast pots and kettles. Usually it is applied to a cast iron pot or kettle with a flat bottom having three legs to hold the oven above the coals, flat sides, and a flat flanged lid for holding coals. These ovens have a steel bail handle attached to “ears” on each side of the oven near the top for carrying. Cast metal pots have been in use since the seventh century. The Dutch Oven of today has evolved over the years as various manufacturers made refinements and improvements over previous versions of cast metal pots. The most common are cast iron but aluminum is also used. Dutch Oven cooking has a long tradition in Boy Scouting, although we don’t usually take them on backpacking trips. Troop 6 has been doing Dutch Oven brunches for Trinity on Scout Sunday for about seven years. (in 2006). Mix the cake mix following directions on the box, adding 3 eggs, ⅓ c oil, 1 c water in the Dutch oven. Stir in the nuts. Pour the apple pie filling over the top of the cake, making sure to spread to the edge. Sprinkle with cinnamon. Bake using about 14 coals on the top and 14 on the bottom. The number of coals varies depending on the temperature and wind speed. Check it after about 30 minutes - it should cook for about 45 minutes. Do not overcook. Scoop out an enjoy. Brown the sausage and onion in the dutch oven. Remove and brown the hash browns in the drippings. Return the meat, add the eggs and stir. Cook for about 15 minutes, then spread cheese over the top and cook for 5 more minutes. Serve with ketchup and salsa. Brown or boil the ribs. Add vegetables. Pour in the BBQ sauce and stir. Cook for at least 2 hours, stirring occasionally. Put everything together in the DO and mix well. Put pats of butter on the top. Bake for about 30 minutes until firm. Stir together all ingredients just until mixed - do not beat. Pour into greased and floured tube pan or 13x9 pan. Bake 75 minutes for tube and 55-60 minutes for 13x9. Boil above together for 5 minutes to soft ball stage in a large pot. Remove from heat and add 1 tsp baking soda - soda will cause foaming so be careful. Slowly pour over 3 quarts popped corn. In 1987 as I became a member of the Bereavement Committee I noticed one of the favorite salads donated to funeral meals was Dorothy Eagle’s aspic salad. A short cut I used to make this salad was given to me shortly after and I have enjoyed it very much. 1 package Jello diluted with the usual 2 c boiling water, stirred for 2 minutes. In Place of 2 C of cold water, use 2c V8 Juice. The result is delicious. The process is easy. As a child growing up attending Trinity I came to know Mary Dawson in the capacity of adult leader and friendly church lady. She was so much a part of all we children’s Sunday mornings. When I was married in 1948 she attended the reception held in Trinity’s parlor. She gave me a framed sepia-toned photo or Mt. Moran to remind me of the beauty of our area as I went off to Illinois to live. Sherry Best.